Are you planning your own wedding over the next couple of years and need some inspiration? Or perhaps you’re still obsessing over the Royal Wedding… We thought we’d give you a rundown of the 2018/19 wedding trends you might start seeing over the next couple of years. The type of flowers you have traditionally played a big part in the overall planning of your wedding, they always have done. However, one of the biggest changes we are going to start seeing is the volume of flowers and floral aspects in wedding venues. Floral installations and hanging flowers are set to be one of the newest trends for weddings over the next couple of years. Greenery and hanging floral installations above tables create a dynamic to the space, making use of a space that would normally be empty while playing around with height and viewpoints is a great way to utilise space. Immerse your guests’ tables in floral decor! We are going to start seeing a mix of different flowers accessorised with coloured glass, vintage cut glass and vessels. The bolder the floral decor the better, you could even have pastel colours with a hint of bright colour if you want to play it safe. This was a big trend a couple of years ago, however, we are set to see it return. Having a French-inspired wedding venue is becoming increasingly popular. Choosing a traditional venue and being able to add modern aspects to it is now very appealing and an easy way to incorporate different features into your venue while still following this years wedding venue trends. Over the next couple of years, we are going to start seeing a shift from the traditional 3-course set menu to a variety of different foods – from big sharing dishes to street food style meals. Why not inject some of your own personal favourite foods into the wedding menu? Your wedding day is all about yourself and your partner, therefore, show your guests’ a bit about yourselves in the food you serve. There’s nothing better than adding a fun twist to the drinks you’re serving at your wedding. Instead of just having the standard cocktail name on the menu, why not change it to something relating to you and your partner, or even an inside joke you two share – make the drinks a talking point! Believe it or not… having your four-legged friend on your big day is becoming a big trend! More and more couples are now starting to incorporate their pets (or even just hired animals) to participate in their wedding day. 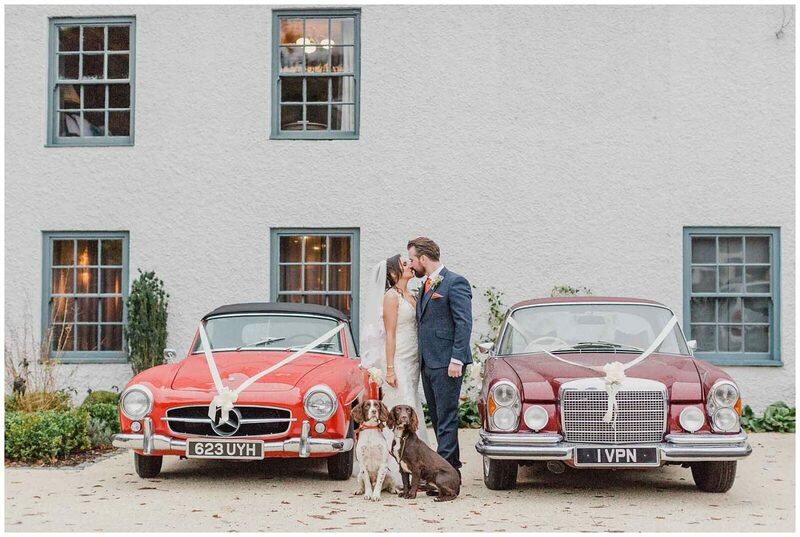 We have a whole blog post about dog-friendly wedding days *link to post not live yet* which you should have a read of if you’re planning on doing this! If you’re looking for a French-inspired venue or if you’re looking to for wedding venues in Northumberland then don’t hesitate to get in touch with us for more information.